Everyone has their own favorite meals, chosen from the familiar food groups. Steak, potatoes, spaghetti, oatmeal, and miscellaneous whatnot. But it's all so common. Sometimes I wish there were other things besides that, like if everything was edible. You might have an old desk you want to get rid of. It's a shame to let that much food go to waste. Or how about this, I threw out an old printer a few weeks ago. I'm sure with the right set of choppers and a digestive system more advanced than mine, it might've made a nice diversion from my usual boring fare. The whole thing reminds me of a tour I took of a psychiatric hospital museum in Missouri. They display a bunch of metal, safety pins, screws, and assorted things some guy ate there years ago. He was on the right track of what would be more desirable, if only we could digest it. It truly did look yummy. What'd that guy have? Let's establish this much, he had an appetite. What did he not have? Just guessing, I'd say he didn't have a cookbook, recipes. He was simply eating the stuff raw and letting it go at that. But think of it, he could've been fixing delicacies, mixing screws and things with actual food, and perhaps other non-metallic non-food objects, for more of a taste sensation. I might've recommended to him something along the lines of a raisin bread, but instead of raisins the things he obviously craved. Of course he needed his metal -- that's where you get iron -- but what if there were a few softer bits of wood in this bread, even something fine like the shavings off a small dowel. It'd give just a hint of wood grain flavor, then it'd be nice to have a few safety pins glazing the crust; in addition to being delicious it'd be beautiful. Might've won a blue ribbon, which are also delicious, significantly tangier than red or, certainly, green. Green ribbons need to ripen. I'm not putting a lot of effort into the following sample recipes, because I know most of you are prejudiced against them. 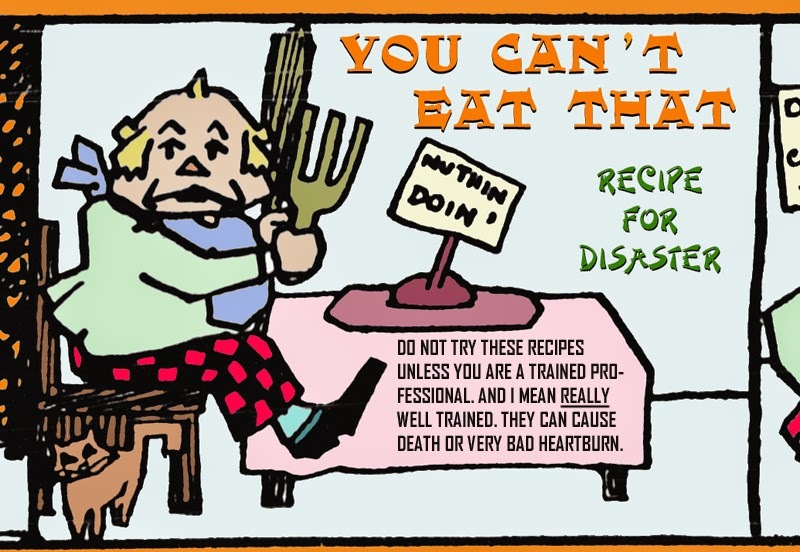 But let me warn you, for my own piece of mind, that you should not try any of these recipes without at least consulting with your nutritionist. And probably your doctor. 1) Fix a normal batch of spaghetti. 2) Eat all you want. I like this recipe, since there's no tedious measuring to get a precise single serving. 2) Since you can't do that, eat a turkey sandwich. 3) But since it's also hard to catch turkeys, have a peanut butter sandwich. 4) Spread peanut butter on bread. 1) Prepare chili according to the standard recipe, with one major change. Use rubber duckies instead of beans. 1) Boil railroad spike until soft. 2) If the spike doesn't soften in five hours, remove the broth from the pan so it doesn't all evaporate. 3) Boil spike another five hours. On the off chance it never softens, cut celery to resemble a spike. 4) Mix celery with broth. I don't have a good recipe for this. Even if I did, I can't sew.